Do you know why one of these girls will do better in school? Children grow up being exposed to very different language environments. Sara hasn’t started school yet. She is only three, and spends her days with either her dad or in her day care center. Sara’s dad also loves reading to her, and she knows this. She also knows that when she crawls up into their big comfy chair and pats the space beside her grinning, he too will smile broadly and ask what she wants to read today. It is more than a book. It is the feeling of being cherished, and of being transported to lands beyond our own that makes reading together so special. At daycare, she is surrounded by caring people who read to her, ask her lots of questions, and respond to her questions patiently. Like Sara, she splits her time between a parent or with a family member who babysits for free. Jessica’s mom does not include Jessica in conversations or talk much with her when they are together. She tells her when she should do something, like “Get your coat on,” or “Turn off the TV,” but for the most part Jessica’s time with her mother doesn’t include a lot of dialogue. Jessica’s mom is a good mom, keeping her fed and clothed and safe from harm, but just doesn’t see much use in talking with a child who can’t talk very much herself. They don’t have many books at home, partly because Jessica’s mom wasn’t read to when she was little, and also because books cost a lot. Besides, there will be a lot of books at school where Jessica will learn to read. At the grocery store, Jessica points to a cereal box and says “C” to show she has learned that letter, and her mom firmly puts Jessica’s hand back on the cart and says that they aren’t buying any cereal today. With her babysitter, Jessica likes watching TV but gets bored with that, and when she takes one of the few books available to her sitter to be read to, she is told to wait. Both girls arrive at school the same community kindergarten with healthy bodies and minds. Sara will outperform Jessica right away, and probably throughout their schooling and beyond. WHY? Because Sara knows more words. 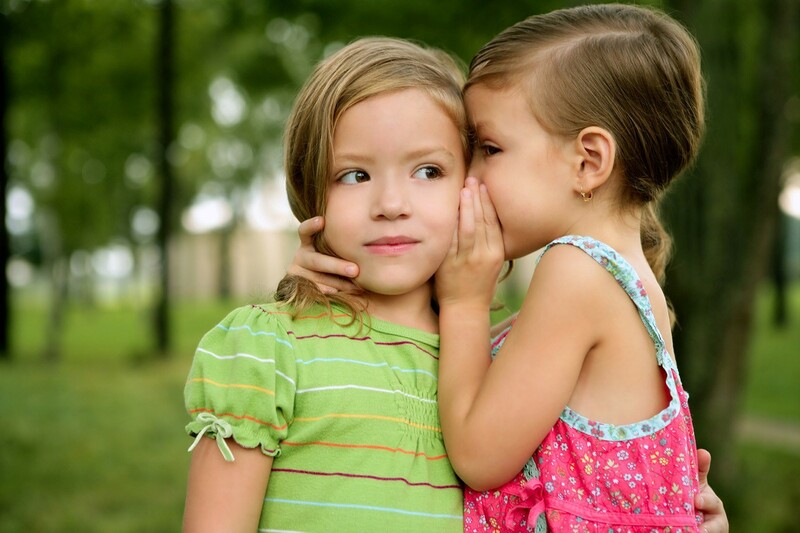 In fact, researchers show that at three, Sara probably knows more than 1,000 words, which is twice as many as Jessica. And by the time they are four, Sara will have heard 45 million words compared to Jessica’s 13 million. THAT IS A 30 MILLION WORD GAP! 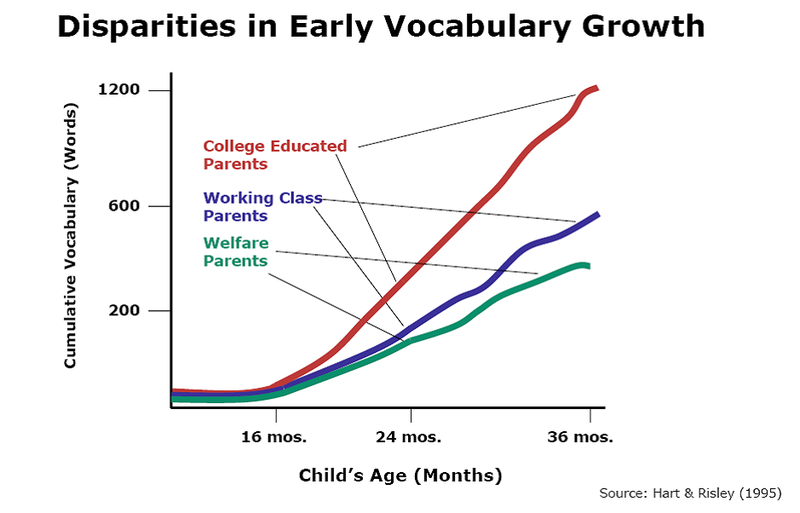 One reason this is so important is that vocabulary size — which goes hand in hand with language ability — predicts school achievement both in the early grades and beyond. Children’s initial understanding of numbers relies on language-based associations. The second reason — this is important — is because Jessica will NOT catch up with Sara unless someone helps her. Students with limited vocabularies lack the tools to fully take advantage of academic experiences, so they fall even further behind academically. Adolescents and adults 16–24 years old have limited job and educational prospects due to poor literacy skills. What can you do to help Jessica? 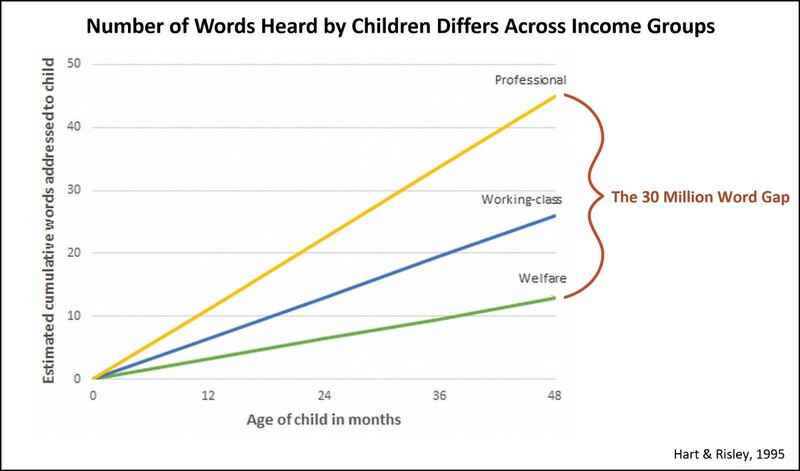 The seminal study showing these dramatic differences (graphs above) shows that children’s language is strongly related to their parent’s income level and education. Parents who have more education tend to talk more with their children, and use different words. THIS DOES NOT HAVE TO BE THE CASE, HOWEVER. If you (or someone else who loves your child) interact this way with them, it will literally put them on the road to success.